Today's Lesson will focus on The Industrial Workforce during the Gilded Age of U.S. History. Let's begin by focusing our attention on the Lesson Mission. Write The Industrial Workforce as the next entry in the Table of Contents of your Lesson Chronicles. 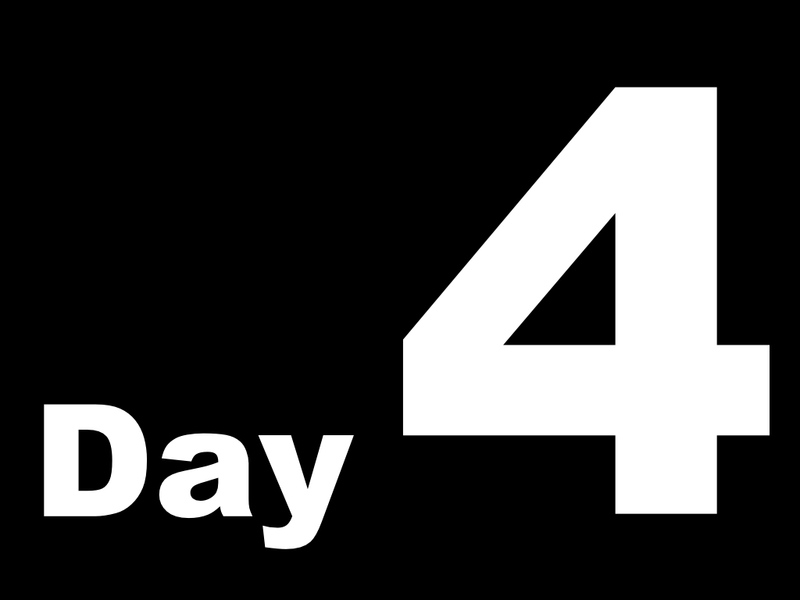 Turn to page 24 in your Unit 1 Lesson Chronicles. Write your name, and the date at the top of page 24. What was the industrial workforce of the Gilded Age; who made up this workforce; and what was life like for these people? This portion of your Lesson Chronicles is embedded below. I can create a skeleton outline of a nonfiction text about the industrial workforce of the Gilded Age. Now we will practice a "Before You Read Strategy" when reading nonfiction text. It is called a skeleton outline. In a skeleton outline, you identify the headers and subheads in the text and analyze the way that they are organized, to make predictions about the text. Write the Challenge 1 Target in your Lesson Chronicles under the Challenge 1 Target header. 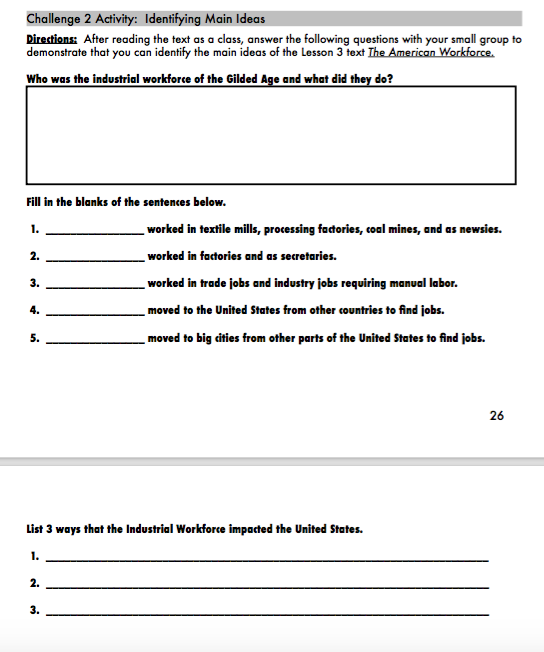 Under the Challenge 1 Activity header in your Lesson Chronicles, complete the Skeleton Outline with the class using the Lesson 3 Reading below, The American Workforce. Now that you have used headers and sub-headers to make predictions about today's reading, we will read the Lesson 3 text, The American Workforce, below. The word workforce refers to all the people that work for an industry or all the workers in a nation. A new American workforce helped to expand business all over the United States and made industrialization possible. Without enough people to work in factories, the United States would not have been successful in industrializing and definitely would not have become a world power. In the last three decades of the 1800s, American workers not only produced goods for the United States, but for the world. American-made clothes, shoes, textiles, machines, steel, oil, rubber, and tools were just a few of the things other nations bought from the United States. Nations around the world also relied on iron ore, coal, and lumber from the United States. The United States built incredible railroad systems and shipping ports in order to get goods to places everywhere. None of this could have happened without the American workforce that sewed the clothing, dug the coal, forged the steel, operated the railroads, and stoked the fires of the many thousands of factories, mills, mines, and workshops that spread over the United States. The American workforce that made industrialization in the U.S. a success included: men, women, and children. They were American born and immigrants. They were many different races, ethnicities, and religions. These people worked very hard and suffered great hardships as they worked to provide their families and build the American infrastructure. Industrial work was very hard and dangerous work. During the Gilded Age about 1 million workers were injured on the job and about 25,000 people died on the job. There were no safety codes and the industrialists were not held responsible for workers who were injured or the families of workers who died. In fact, industrialists would fire injured workers who could no longer perform their job. Industrial workers worked about 70 hours a week for about 10 cents an hour. Many worked doing hard, manual labor and were not given breaks. In 1900, the average income of the American worker was $400 to $500 a year. It is estimated that it cost about $600 during this time for a family of four to pay all their bills and eat reasonable meals. All kinds of people made up America's workforce. Men mainly worked trade jobs. Women worked in factories and took jobs as secretaries. Immigrants came from all over the world and worked in every industry. African Americans migrated from the South to find better opportunities in the North after the Civil War. Children of poor families took jobs as well. Most men who were not farmers had trade jobs or industrial jobs that were outdoors. These jobs required, hard, manual labor. They worked in mines, for logging companies, railroad companies, on commercial fishing boats, and in processing mills and refineries. These jobs were highly dangerous. They were paid a little more than factory workers, but their wages were very low and the chances of injury or even death were great. Men mainly worked for railroad, mining, steel, and oil companies. These jobs were highly dangerous. Train wrecks, fires, dynamite accidents, and machinery malfunctions were common in railroad and oil work. Floods, cave ins, explosions, accidents with tools, and coal dust killed miners. Many miners suffered from black lung. Black lung was a disease of the lungs, where a person has difficulty breathing and heavy coughing from breathing in black, coal dust. Steel workers had to be mindful of molten iron pots. Sometimes spills from these pots caused explosions. Workers were burned by splatter from these pots. Even small splatters caused serious burns. Large spills were fatal. As industries spread all over the United States, more people were needed to work. Poor families who were struggling to survive needed every available member of the family working. 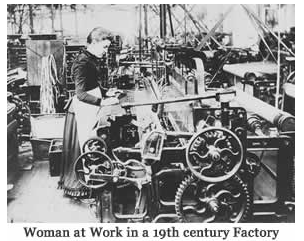 From 1880 to 1900 many women entered the workforce. In 1800, there were 2.6 million women working. Women mainly worked in factories or as secretaries. By 1900, 8.6 women held jobs. In 1880, only 4% of secretaries were women. By 1920, 50% of the nation's secretarial jobs were held by women. Factory work was very hard on women. 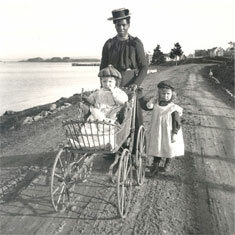 After working a 12 to 16 hour day, many women came home to take care of the children, cook, and do household chores. Factory owners only paid women half of what they paid men though they were both did the same job. Women who worked in garment factories made about $104 dollars per year. Women working in shoe factories made a little over three dollars per week but the cost of the materials to make the shoes were subtracted from their pay. black lung: a disease of the lungs, where a person has difficulty breathing and heavy coughing from breathing in black, coal dust. spinner: textile workers who spun cotton into thread using spinning machines. Nystagmus: a disease caused from being in the dark for long periods of time that causes a person's eyes to wander from side to side on their own. prejudice: an unreasonable feeling of dislike for a person or group because of race, religion, gender etc. labor unions: organizations that work to gain better hours, wages, working conditions, benefits, and treatment for workers. Factories in the Gilded Age did not have to abide by health and safety regulations. Many women became sick from working with dangerous machinery in dim, cramped, and poorly ventilated factories. Brown lung was a disease of the lungs that caused difficulty breathing and severe coughing. It was caused by breathing in dust from cotton processing. Illnesses spread quickly in cramped factories. Many women developed fatal illnesses from workers who came to the job sick. Workers were not given sick days and if they did not come to work, they were fired. One sick worker could infect an entire factory with diseases such as smallpox, typhoid fever, malaria, yellow fever, cholera, and tuberculosis. By 1900, children made up 20% of the American workforce. Over 1.7 million children under age sixteen worked in factories or fields. This was 20% of all American boys and 10% of all American girls from age ten to fifteen. Factory owners hired children because they could pay children less than adult workers. Children also had more energy, could get into small places, and could be punished for making mistakes. Because the poor needed their children to work, poor children did not receive an education. Without an education, children had no hope of making a better living as adults. Laws eventually made school mandatory for children, but it took a long time to enforce the laws because so many parents relied on their children's wages to help support the family. Children were hired by all industries to perform dangerous work in poor working conditions. In textile industries, children worked as doffers, spinners, and sweepers. Doffers replaced full bobbins of thread that had been spun by spinners, with empty ones. Spinners spun cotton into thread using spinning machines. Many children who worked in factories developed a disease called rickets because there were few or no windows and children were not allowed to go outside. Rickets was a disease caused from lack of vitamin D and sunlight. Like the women who worked in factories, children also developed fatal illnesses. Children lost limbs from crawling on and under dangerous machinery. They were yelled at and humiliated. Some were beaten. One common punishment for being late or not working hard enough was called weighting. Weighting was a type of punishment where factory managers tied a heavy weight to a child's neck while he or she worked. It was meant to be a warning to the other children. Boys as young as 8 years old were hired to work in coal mines as breaker boys to break up coal and carry it out of the mine. Some boys were used to crawl into spaces too tight for grown men. Breaker boys dealt with the same working conditions as adult miners. Children also suffered from rat bites and Nystagmus. Nystagmus was a disease caused from being in the dark for long periods of time. It causes a person's eyes to wander from side to side on their own. Like the children who worked in factories, they were beaten for doing poor work or showing up late. Children worked in many other industries as well. They worked as newsies and shoe shiners. They shucked oysters in seafood processing factories and carrying water for railroad industries. Children were an important part of the American workforce in the Gilded Age and played a very important role in the growth of industries. Many people migrated to cities to find work in industries during the Gilded Age. A migrant is a person who moves from one part of a nation to another part of the nation to live. Two main groups of migrants in America during this time were famers and African Americans. As farming equipment improved, one farmer could harvest more crops in a short amount of time. It became harder for farmers to make a living. Many men had to move their families to the cities to find jobs. Migrants found jobs in all types of industries. Many times, the entire family worked to help support the family. After the Civil War, discrimination and prejudice drove many African Americans out of the South. Some went West, but many went North to big cities, hoping to get jobs as factory workers. So many African Americans left the South that their leaving became known as the Great Migration. African American men took jobs mainly in the steel, automobile, shipbuilding, and meatpacking industries. Many women worked as house attendants and cooks. Though African Americans made better wages in Northern factories than they did farming in the South, they still faced discrimination in the North. African Americans were not allowed to be promoted to management positions. Many white Northerns became angry because they felt that African Americans were taking their jobs away. Even though African Americans faced discrimination in the North, it did not stop them from taking industry jobs. Between 1910 and 1920, the number of African Americans working in industries almost doubled from 500,000 in 1910 to 901,000 in 1920. In the 1880s, immigrants were the largest group working in American industries. An immigrant is a person who moves away from their home country to live in a new country. Many other nations noticed the American economy growing. They heard about how America was a land of opportunity for everyone. There were many people in other nations who experienced poverty, oppression, persecution, and discrimination. Many people wishing to escape these things packed up their families and moved to America. They hoped to start a better life in America. Educated immigrants started businesses. Most immigrants, however, were uneducated. They were poor and unable to afford moving. They were forced to settle in cities on the coasts, close to the ports in which they arrived. Many immigrants were disappointed after they came to America. They realized that conditions in America were not much better than in their own countries. Immigrant workers, like other industrial workers, experienced mistreatment in the workplace. The new immigrant workers who came into an industrial job were called greenhorns. Greenhorns were almost always given the most dangerous work. Men, women, children, migrants, and immigrants all poured into industrial cities to find work in all kinds of industries. With all of these new people, cities became overcrowded. Cities could not build their infrastructure before great masses of people started pouring in. When American cities began growing larger and larger it was called urbanization. Urbanization caused major problems for cities. As the workforce grew, so did workers' discontent. Workers became more and more upset about the way they were treated by, bosses, factory mangers, and industrialists. They became tired of working long hours, for low pay, in poor working conditions, with no respect, or benefits. It did not take long for workers to realize that their one strength was in their numbers. Workers began to form groups called labor unions. Labor unions are organizations that work to gain better hours, wages, working conditions, benefits, and treatment for workers. The industrialists became angry with labor unions. They felt that labor unions were violating their rights to run their business as they saw fit. Many times industrialists and labor unions would get into big arguments. Sometimes these arguments ended violently. These fights between labor unions seeking better treatment for workers and industrialists protecting their right to run their business became known as the labor wars. I can identify the main ideas in a nonfiction text about the industrial workforce of the Gilded Age. Now we will practice a "During the Reading Strategy" when reading nonfiction text. It is called Determining the Main Idea. 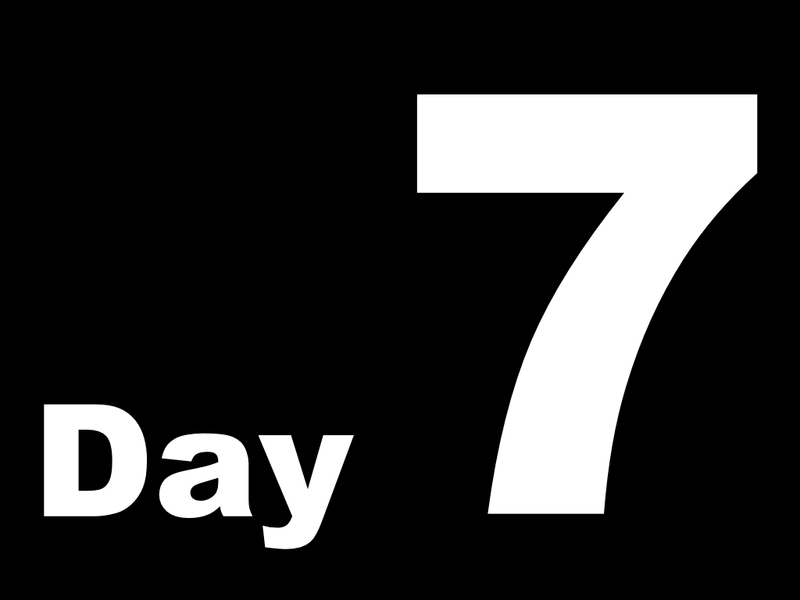 Write your name and date at the top of Page 26 in your Lesson Chronicles. Write the Challenge 2 Target on Page 26 in your Lesson Chronicles under the Challenge 2 Target header. 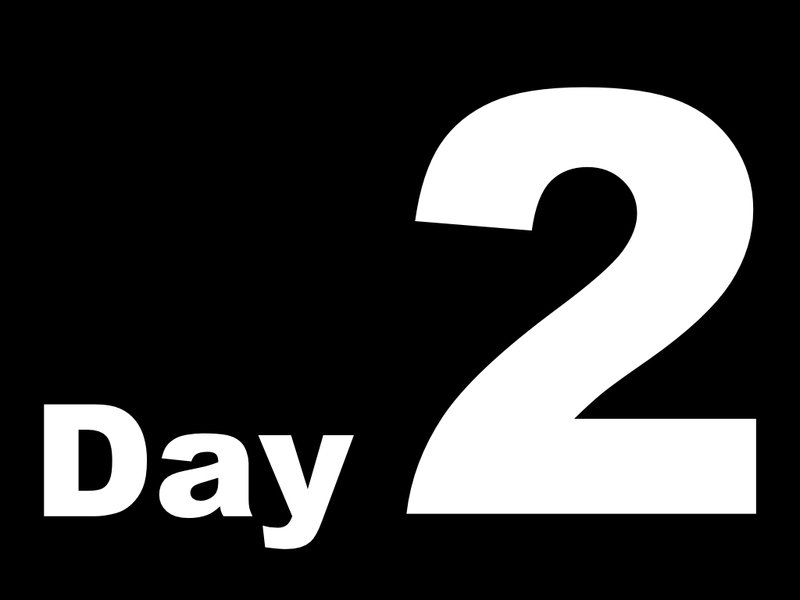 With your small group teams complete Challenge 2 on Pages 26 and 27 of your Lesson Chronicles. In these activities, you will fill in the blanks to complete the main ideas of the Lesson 3 text. I can define important vocabulary in a nonfiction text about the industrial workforce of the Gilded Age. Now we will practice an "After the Reading Strategy" when reading nonfiction text. It is called Defining the Vocabulary. Write your name and date at the top of Page 28 in your Lesson Chronicles. Write the Challenge 3 Target on Page 28 in your Lesson Chronicles under the Challenge 3 Target header. To define important vocabulary, you identify bolded words in the text. 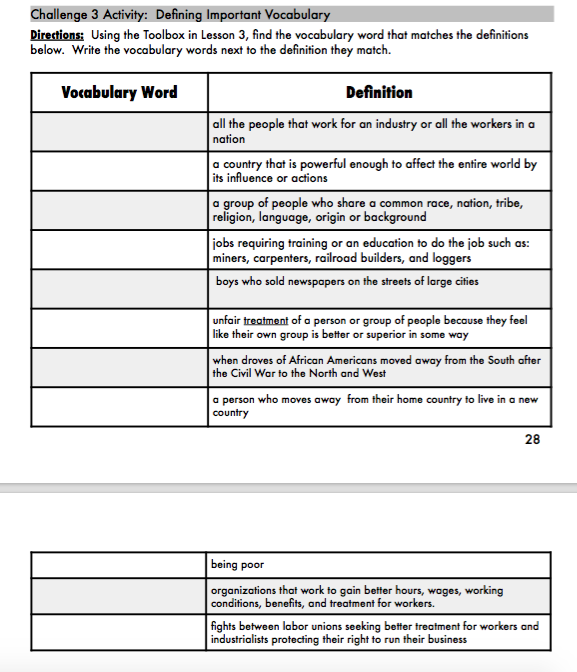 Then you give the definitions of those words using the Lesson Toolbox. With your small group teams, read each of the definitions on Pages 28 and 29 of your Lesson Chronicles. 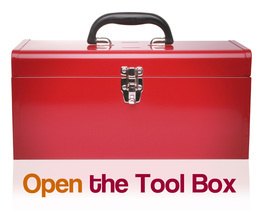 Use the Lesson 3 Toolbox to identify the word that matches each definition. Write the word in the Vocabulary Word Column next to the definition that it matches. 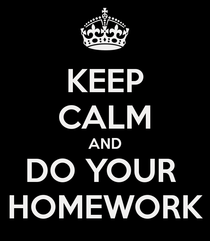 I can gather information from a text about Child Labor during the Gilded Age. Now we will practice activity called, Gathering Information from Multiple Sources to Identify a Common Theme. In this activity, you will gather information from different texts to identify a common theme. Write your name and date at the top of Page 30 in your Lesson Chronicles. Write the Challenge 4 Target on Page 30 in your Lesson Chronicles under the Challenge 4 Target header. To gather information, you will click on the icon below, The Child Labor History Interactive. In your small groups, click on the Child Labor You Choose Adventure Icon. 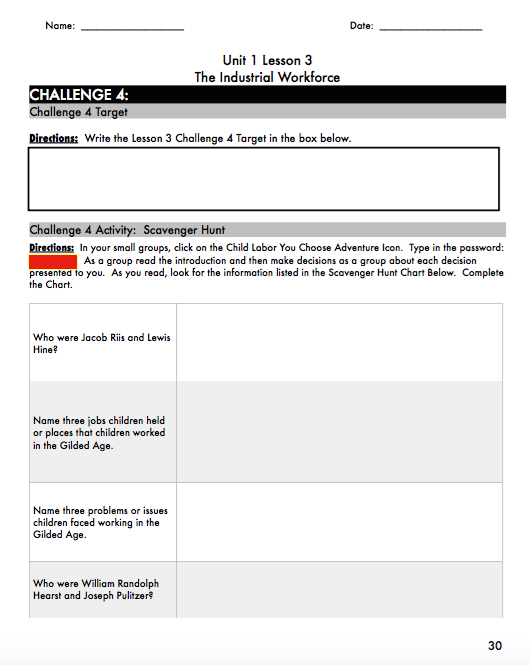 Type in the password that is bolded and highlighted under the Challenge 4 Activity Header on Page 30 of your Lesson Chronicles. As a group, read the introduction and then make decisions as a group about each decision presented to you. 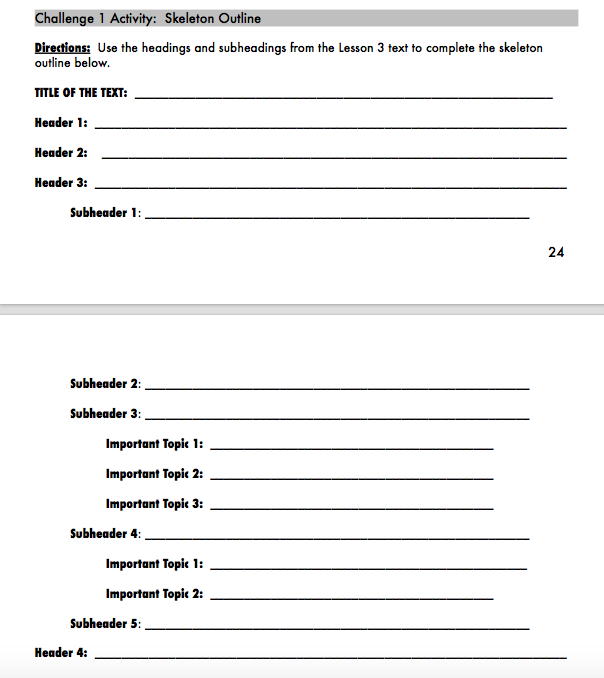 As you read, look for the items listed in the Scavenger Hunt Chart on Page 30 of your Lesson 3 Chronicles. ​Write the information that you discovered next to the item in the chart. Click on the icon below to participate in the Child Labor Interactive You Choose Adventure. Type in the password given to you on page 30 of your Lesson Chronicles. I can gather information from a text about the Workers on the Transcontinental Railroad during the Gilded Age. Write your name and date at the top of Page 31 in your Lesson Chronicles. Write the Challenge 5 Target on Page 31 in your Lesson Chronicles under the Challenge 5 Target header. To gather information, you will click on the icon below, The Transcontinental Railroad Worker History Interactive. In your small groups, click on the Transcontinental Railroad You Choose Adventure Icon. Type in the password that is bolded and highlighted under the Challenge 5 Activity Header on Page 31 of your Lesson Chronicles. As you read, look for the items listed in the Scavenger Hunt Chart on Pages 31 of your Lesson 3 Chronicles. I can gather information from a text about Irish Immigrant Workers during the Gilded Age. 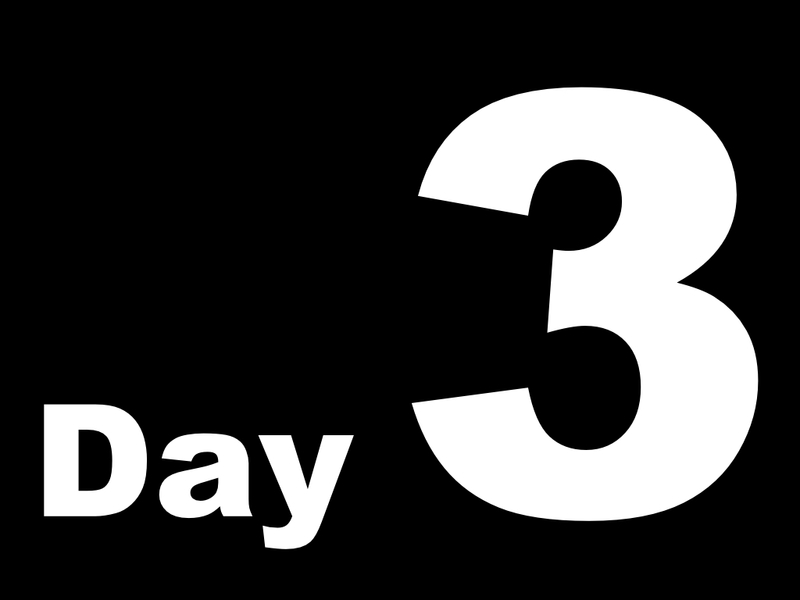 Write your name and date at the top of Page 33 in your Lesson Chronicles. 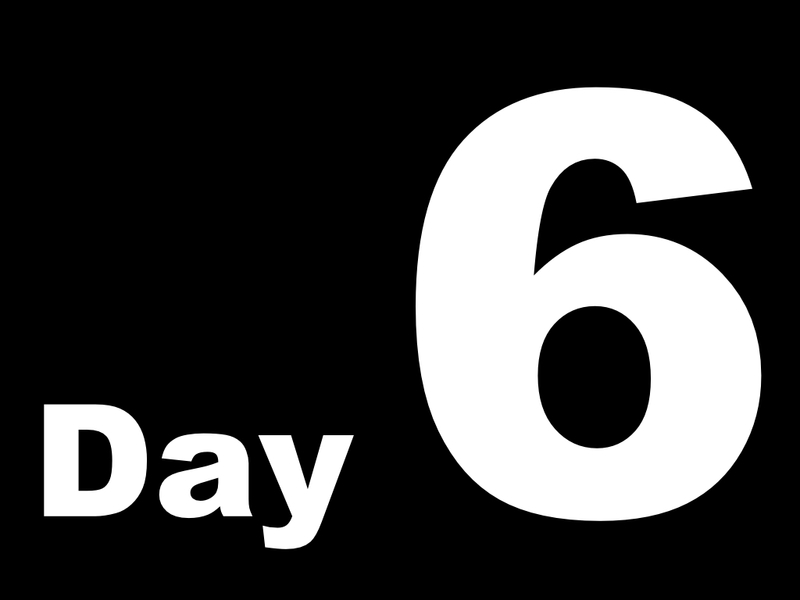 Write the Challenge 6 Target on Page 33 in your Lesson Chronicles under the Challenge 6 Target header. To gather information, you will click on the icon below, The Irish Immigrant Worker History Interactive. In your small groups, click on the Irish Immigrant Worker You Choose Adventure Icon. 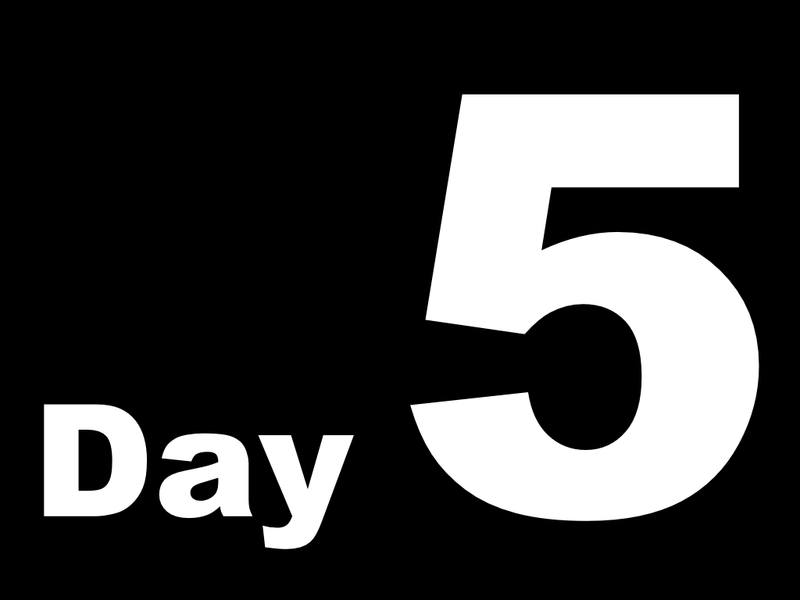 Type in the password that is bolded and highlighted under the Challenge 6 Activity Header on Page 33 of your Lesson Chronicles. As you read, look for the items listed in the Scavenger Hunt Chart on Pages 33 of your Lesson 3 Chronicles. I can analyze information that I have gathered from different types of text about the Industrial Workforce in the Gilded Age. Now we will practice activity called, Applying Information Gathered from Multiple Texts . In this activity, you will use all the information that you have gathered in your Lesson Chronicles to identify a common theme and answer the Lesson Mission Question. Write your name and date at the top of Page 35 in your Lesson Chronicles. What is the common theme of all the things you read and all the activities you have done in this activity? How do you know? Look under the Mission Accomplished Header on page 35. The Lesson Mission Question has been restated for you. Use your Lesson Chronicles and the Lesson Module to answer the Lesson Mission Question in the box below the Mission Accomplished Header. Remember, this is an individual activity. You will do it on your own. Fully answer all parts of the Lesson Mission Question in your own words. 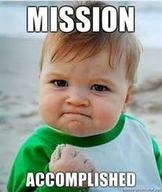 Did you accomplish the Lesson Mission? Let's see if you can apply the information you have gathered to answer questions about the industrial workforce of the Gilded Age. ​Click on the Mission Check icon below to complete the Mission Check Activity. Click submit when you have completed it. I will read these aloud to some classes. I will print out your certificate and return it to you tomorrow. When you receive it, glue it into your Lesson Chronicles on Page 36 under the Mission Check header. You have completed the Unit 1 Lesson 3 Module!